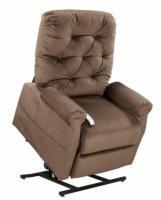 The Leather lift chair from Pride is simply a step beyond luxury. Covered in genuine leather on all seating surfaces, the Leather lift chair is certain to put a smile on your face the first time you down. It's also a fully functioning, three position lift chair as well. Ideal If You Are Over: 5' 8"